The Khans and Bachchans caught up at Dhirubhai Ambani International School's annual function on Saturday. AbRam and Aaradhya's school annual day festivities appear to have been scheduled for two days - December 15 and December 16. On Saturday, the four-year-old Khan - AbRam - was accompanied by his family, the entire of it, to his school's annual day celebrations. 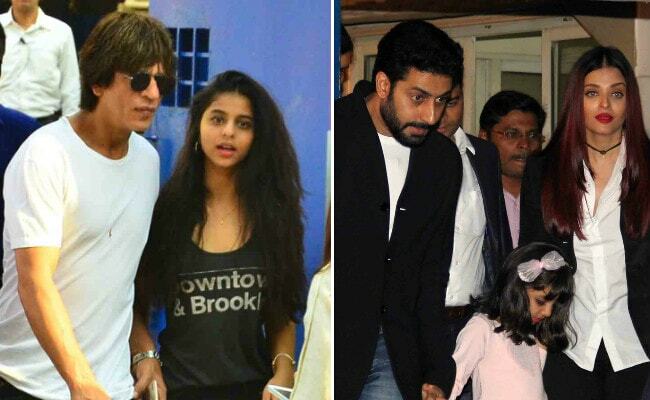 AbRam's elder brother Aryan, 20, who makes rare appearances at showbiz parties and get-togethers, also dropped by for AbRam's special day in school and so did Shah Rukh's middle child Suhana, 17. The Bachchan clan (minus Amitabh Bachchan) arrived to join Aaradhya at the event - Abhishek Bachchan and Aishwarya Rai were photographed with their six-year-old daughter at the venue. Also joining the celeb roll call was Hrithik Roshan, who arrived with ex-wife Sussanne Khan and sons Hrehaan, 11, and Hridhaan, 9. At the arrival counter, Suhana was spotted checking in with her superstar father, both dressed in casuals, while after the event, Aryan and Gauri were spotted being safely escorted to their cars. Ash and Abhi checked out of the venue with Aaradhya in tow while Hrithik and Sussanne made an exit with the kids. Shah Rukh appeared to have a great time at the event, which inevitably called for an Instagram post: "Spectacular DAIS Annual Day. God Bless you Nita Ambani for loving the kids. Made me nostalgic when to act was not important just trying was..," he wrote along with a collage of photos from the function. Spectacular DAIS Annual Day. God Bless u Nita Ambani for loving the kids. Made me nostalgic when to act was not important just trying was.. The school's annual day festivities took off on Friday, when Abhishek and Ash, along with their mother Jaya Bachchan and Brinda Rai, accompanied Aaradhya to the school event. Amitabh Bachchan, who was busy with the Thailand schedule of Thugs Of Hindostan, could not attend the annual day function but really missed being there. On the work front, Shah Rukh Khan is currently shooting for Anand L Rai's much-talked about untitled film, which also stars Katrina Kaif and Anushka Sharma. Amitabh Bachchan has films like Aamir Khan's Thugs Of Hindostan and 102 Not Out in the pipeline.